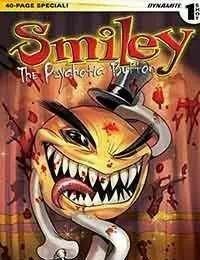 How horrible could the origin of Evil Ernies best friend, Smiley the Psychotic Button, possibly be? Well... it involves Lucifer, mass murder, massive citizen complacency, the struggle to control hell, and the tastiest hamburgers your hard-earned 99 cents can buy, so horrible might not be descriptive enough. Plus, in a very special back up story, heaven unleashes its own trinket to battle the Smiley! The Holy Pizazzinator is born!